Preheat oven to 350 degrees F. Line a 9x5 inch loaf pan with regular foil. Do not use non-stick. In a food processor or small coffee grinder, grind the sugar until it is very fine. Mix half of your ground sugar in a small bowl with the flour and salt. Set aside. In a large metal bowl, beat the egg whites with an electric mixer until foamy. When foamy, add the cream of tartar and beat until medium peaks form. Slowly beat in the sugar. Beat in the vanilla. With a large scraper, fold the flour mixture in in four parts. Carefully spoon mixture into the ungreased loaf and and bake for 35 minutes. Test with a wooden skewer or pick. 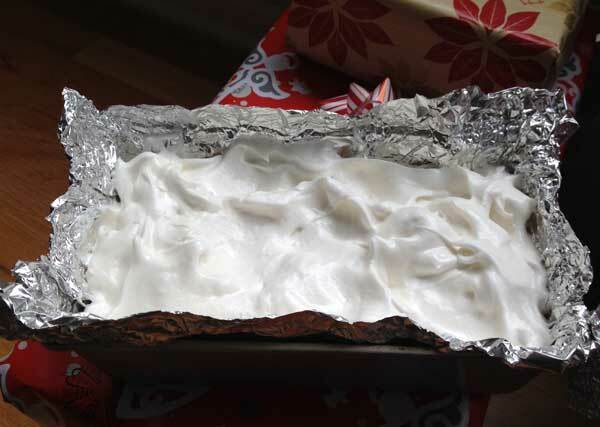 Let the loaf pan cool, then carefully lift from pan and peel away the foil. Also, you can try cooling it upside down for nostalgia’s sake, but this cake is fairly sturdy and has enough flour so that it shouldn’t need to be cooled upside down. It’s not the lightest angel food cake, but it’s really good.